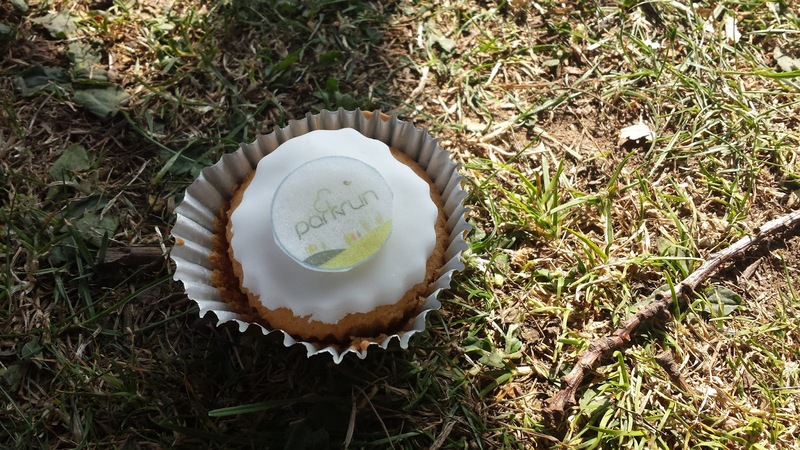 We headed down to Riddlesdown parkrun for the second birthday celebration event. It was to be the 67th time I would run at my home venue. I had decided that today would be a buggy run and I had planned to have a stab at beating my course buggy running personal best, however the combination of congestion and narrow paths at the start meant that it took 6 minutes and 22 seconds for me to reach the 1 kilometre point - At this point I gave up on the personal best idea. I ran the rest of the run hard but with the expectation that I would be miles off my Riddlesdown buggy running personal best, however, in the end I was only two seconds slower - Maybe I should start at the front and let the faster runners filter past me instead of the other way around - That way there's less chance of me clipping someone's heel as I pass and I might actually be able to lower that 'rpbrpb'! 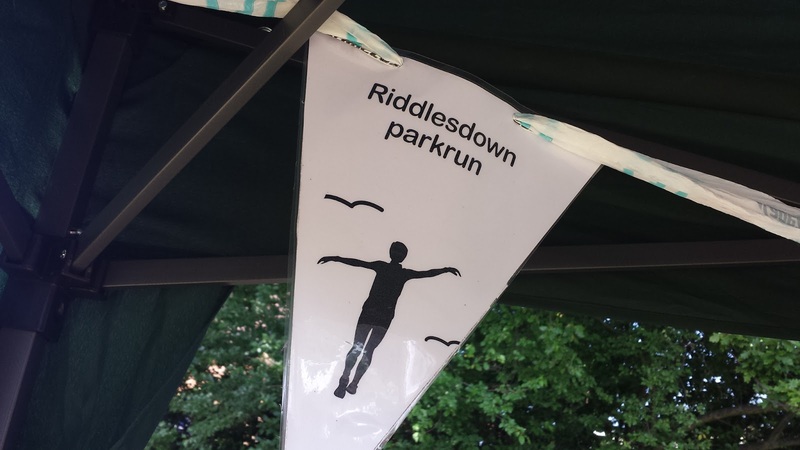 Anyway, the point of the run was to celebrate the second anniversary of Riddlesdown and we did that post-run over at the school. Last year we celebrated undercover. This year the celebrations had been moved onto a small patch of grass and the gazebo had been brought out, along with balloons and a special bunting had been made. Bespoke volunteering hi-vis vests or jumpers were given out to some of the serial volunteers, the points competition winners were given their shields and a few other special prizes were given. 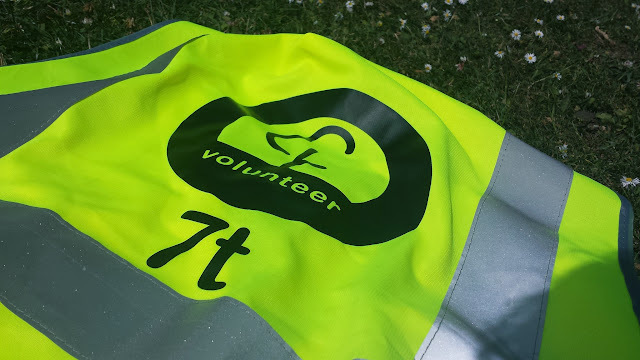 As you'll probably be aware, I'm not a serial Saturday-on-the-day volunteer but as I take care of Riddlesdown's facebook page and volunteer at Bushy Juniors on the first Sunday of every month I was presented with my very own hi-vis vest. There was cake-a-plenty, including a vegan offering and some bespoke parkrun cupcakes. I didn't sample every single variety but the ones I tasted were very nice indeed. Thanks to everyone on the management team at Riddlesdown for putting on such a great event week in week out. And thanks for my bespoke volunteering vest - It's brilliant! Today was also significant for me as sixty-two weeks after joining it, I became a 'former member of the 50 club', and there's only one way to leave a parkrun club - that's by entering a new one! 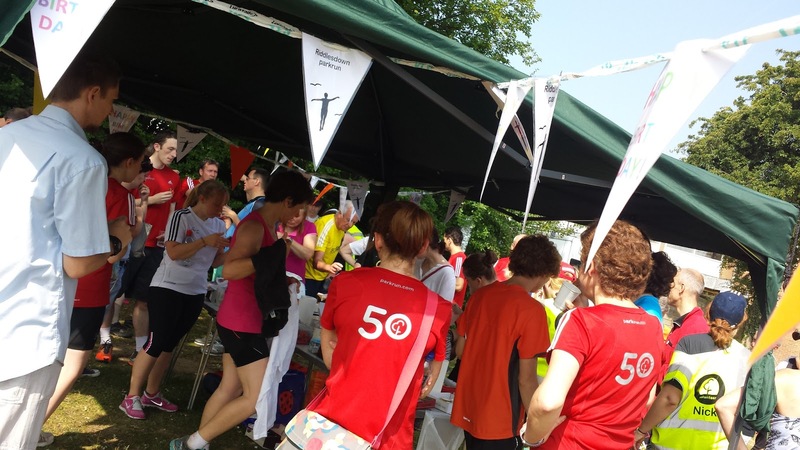 I had originally planned to run my 100th parkrun at Riddlesdown's 100th event, but an injury to my foot meant that I missed 13 parkruns earlier this year and prevented that from happening. So I was delighted when I checked my diary and saw that if all went to plan I could run it at another of Riddlesdown's special runs.